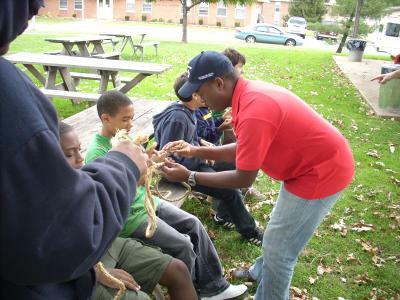 Taurean Branch teaching the first knot - the square knot. (Ken) "Charlie Brown" showing Firem'n Chit basics. David Hodnett supervising proper flag retirement. @BmoreScout on the left margin. Bob Gleason supervised a Scout on proper tool care. 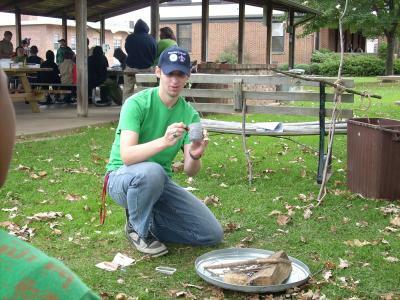 First Class Scout Camp at Maryland School for the Blind location 26-Sep-2009. On Friday, I spoke at the Boy Scouts of America Baltimore Area Council (BAC) about Twitter, but mainly it was about social media and its use in service organizations. I tried to emphasize the "why" social media more than "how" to do it. I hope I succeeded. The meeting occurred out of my digital conversations with Ethan Draddy, the BAC Scout Executive & CEO, as we sparred about how best to use Twitter in our roles as adult leaders. He's a full time paid executive, while I'm a part time volunteer, though my tweet count is a bit higher. As he introduced me, he explained to his team that we had met through Twitter, which I thought was perfect background for why I was there. I suggested to him that my role had been a coach, one who had slightly more experience, but not all of the answers. There's even a book out on the large aggregate markets for relatively unpopular items. It's called The Long Tail. The book referred to is subtitled "Why the Future of Business is Selling Less of More". I'll come back to the "business" and "selling" part later. As I approached this idea, I asked the audience who had heard of "The Long Tail." No hands went up. Great, a coachable moment for all. When I stepped back to as who took statistics in high school, or in college, then who liked it, there were a few hands for the former, just one for the latter. As a mentor, I realized transferring a concept like this was key to my goal in being there, and that it was going to be tricky. On the left, I wrote "Blockbuster"; on the right I wrote "Netflix". When I asked for comments, I heard "bricks and mortar" vs. "internet distribution". That's pretty close to the basis of this theory. The difference between the "long tail" for business and the "long tail" for charitable organizations is subtle. I proposed that the Boy Scouts aren't selling anything. Perhaps they are, but that's not the point. Scouts are a Service Organization. The motto of the Order of the Arrow includes "Cheerful Service". The chart above shows a larger area in reddish-brown than it does in yellow. For the "long tail" concept to work, you should imagine that the yellow area extends off the chart to the right, and that the total area in yellow is greater than the reddish-brown. In other words, Netflix, with smaller sales of each item than Blockbuster, is more profitable. In the quote above, I'd quibble with the term "unpopular" item, replacing it with "obscure" or "less popular". Clearly someone wants to rent those low frequency titles. Turns out Girl Scouts, the organization, does not allow online sales and cites "safety reasons." Human resources folks, responding to pressures from above, state that no one should sell their stuff in the office, Scouters included. But promoting Scouting ideals is not the same, in my book, as doing fund-raising. I'm extremely fortunate that my management and company's philanthropic styles permit me time for camping and service projects. I doubt every company is so supportive. As an aside, the Erielhonan were relatives of the Iroquois; their name means "long tail" (per itcbsa.org). And the Lenai Lennape word Quenischquney or "panther" translates as long-tailed. When I searched for "Scouting" and "long tail" two other definitions of the term appeared, one being story telling at length, the other being animals with long appendages. In times of less mass transit and no interstates, the Lone Scout program was created to serve youth isolated from others. 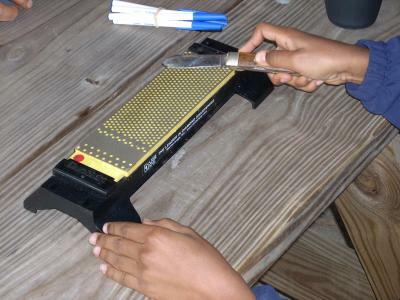 While it existed separate from the Boy Scouts for under a decade, the Lone Scout concept continues. Per Scouting magazine, there were about 400 Scouts active worldwide as of 2001. The handbook is online, too [PDF - 7.2 MB]. It includes a brief discussion of distance communications, suggesting email, and says one Lone Scout "even has his own web site." On the diagram I drew during my chat, I replaced the dollar sign for Sales on the left axis with the word Service. I propose that instead of individual items for sale, that we're talking about individual good deeds, and that reaching out to Scouts, potential Scouts, the general public, and particularly those skeptical of the relevance of Scouting in the 21st century, is imperative. Jim Milham's closing remarks echoed this when he said Scouting needs to continue evolving or we will be left behind. After about 5 months since I started trying to complete the Red and Yellow trails at Broad Creek, I reached Question #1 on the Hiker Award list. It's not because I could not find it before, it just wasn't on any hike plans yet. normal. But I found the marker for the first question and now have 11 left. The biggst distance is in the southeast part of the Reservation, and the most questions left are on the Oest side of the Yellow Trail. A reply to the original request mentioned the Oath/Law; I say more specifics are needed here, as not every situation is obvious to all. I added "Patrol Method" as another guide point - if the group agrees that a particular behavior is acceptable, then as an adult leader, I'm going to accept it unless I see a health/safety concern. For buddy system, think about asking another adult to concur with your web publishing ideas. The most recent time I updated my Youth Protection certification, the instructor was a long-time Scouter who has dial-up, uses email fairly exclusively, and has little understanding of blogs, wikis, much less Facebook or Twitter. I doubt this topic would get a fair hearing. "Common Sense" should prevail. However, as new technologies appear, with previously unimagined data sharing capabilities, we need to continue communicating the risks. I'm a counselor for the Computer merit badge, though I've yet to have any candidates despite being registered for several years. One of the first requirements is to talk about online safety. That's where a Scouter can coach a youth how to act responsibly. How a Scouter should act is a different topic. ... with the former being an active role and the latter being a passive role. I try to be a Mentor to other adult leaders (just ask @EthanDraddy :-). This involves reaching out with new ideas, comments or constrictive criticisms of other Scouters' online behavior, and, well, writing blogs like this one. Being a role model is having the confidence that your online persona (and believe me, your posts are very persistent - there is a 1992 email from me online: http://www.columbia.edu/kermit/ckubwr.html ) represents the ideals of Scouting. I know that I vent sometimes about poor computer software, poor computer performance, and, yes, poor computer software support. I try to maintain a positive attitude, though, and try to find ways improve support, rather than just griping "Augh! I've been put on hold again!" Adding friends on social media has been the trend for a few years. How should a Scouter behave here? First, there's a "degree of separation" between me (or you) and a youth or another Scouter. I have no problem asking Scouters to "join my network" - I belong to several. Asking a youth is a different story. Here are my personal rules. "Friending" is similar to photo-id'ing (tagging someone in an online photo). I prefer to have youth ask me, rather than me ask them. Once they reach 18, I'm OK with posting camping trip photos. Under 18, it's a good question whether or when photos should be posted. If a Scout parent/guardian signs the latest health form where there is a "media release" question, I feel a little safer uploading photos. 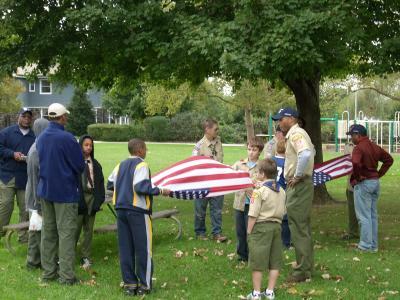 Should a Scout participate in a public event (say, the Dundalk Fourth of July parade), then posting the troop photo seems not only permissible, but a fine way to publicize Scouting. The main issue I look out for are situations where parents may not know where a Scout lives. This is the leader nightmare, of course, where a Scout's whereabouts are revealed unintentionally. But again, with a signed health form and other notifications - "I've updated the troop web site" I'm not losing any sleep. I was already following those not protected from view, except one.